First off, happy 12/12/12! Its not often that happens:) also its not very often that I am surprised by my own cooking.. okay let me rephrase, it's not very often that I make a treat and take a bite, and then look down at that treat in disbelief at the sweet, pure hunk of yumminess that is in my hand.haha This is one of those! I'd had the idea for a while, finally tried it out for a quilt guild party I had recently, and was actually surprised at how much I loved them, take a look! 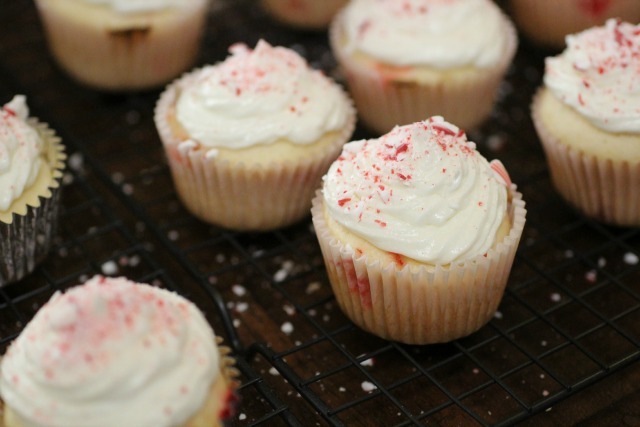 When you take a bite, there are little bursts of the minty peppermint scattered throughout the sweet flavour of the soft fluffy cupcake. oh and the icing?! the silky texture and light rich taste is the perfect combination with the cake itself. Just throw together some cake batter, add a little this and that, and you have yourself the perfect festive treat for any holiday party, or for you and your own family to enjoy...as long as they last:) I literally chose these because I was rushing around and onlyhad a tiny bit of time to make a treat, and they did come together so quickly! while the cakes are in the oven just whip up the icing and ad it to a piping bag, and after they cool you can put them all together and have them done in no time at all! Step #2: Add your batter by the spoonful to your cupcake tin, just one spoonful per liner till they are all filled, then distribute the rest as desired! Bake in your preheated oven for alotted time on the box, or until the edges are a lightly golden brown. Step #3: Mix icing together while the cupcakes are in the oven. After they have cooled a little, pipe the icing in a spiral onto each, and sprinkle the tops with your leftover crushed candy-canes. Enjoy warm, and preferably with a glass of milk. We will be making these for our christmas party, and our christmas get-together, and any other reasons I can think to make them. So festive, and so good! Let me know if you give them a try, and aave a terrific Wednesday everybody! ahh, so festive! i love. looks delish too! I have my girlfriends coming over,and I think I am going to make this, amazing! This look so yummy! I can't wait to go home for Christmas and make all sorts of yummy food and dessert. Yummy for my tummy hehe, looks gorgeous xoxo. New post on my blog, about Olsen twins style! Check it! Oh yum. I wonder how this would be if you substituted a chocolate cake mix. Hmmmm . . . If I have time I will definitely try this. 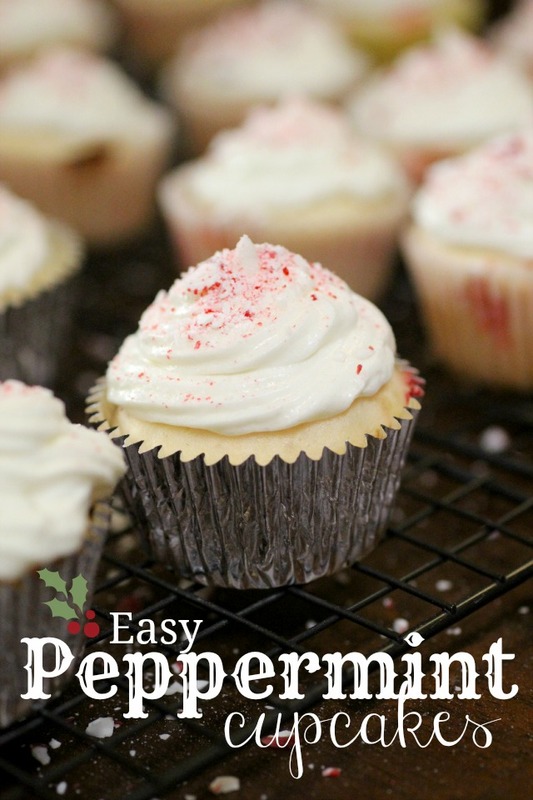 I've been wanting to make some with peppermint and this is perfect! YUM so good :) I wonder if I could add some chocolate to that mix somehow.. I'm in love with your lemon-blueberry ones... So I'll HAVE to try also these!!!! those look yummy! i'm afraid to make them b/c i may end up eating the whole batch myself! These look delicious! I just made chocolate chip nutella candy cane cookies last night - so I'm definitely in a peppermint mood! Thank you for your lovely comment on my blog ! These cupcakes are so delicious ! Yum! 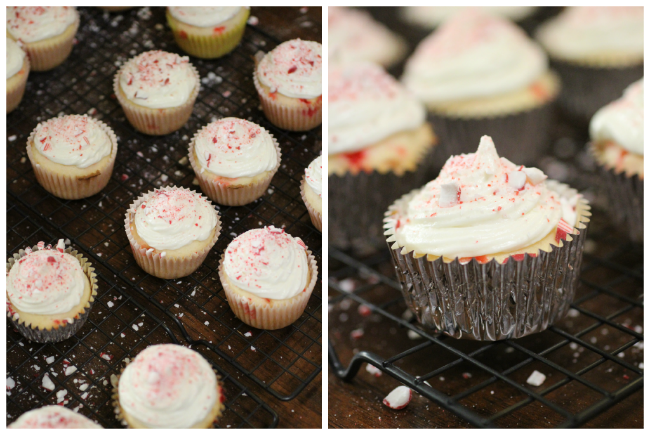 Peppermint cupcakes!! So delish!